A FORMER US Navy pilot, whose UFO sighting was investigated by a top-secret Pentagon team, has said the phenomenon should continue to be probed in case it poses a "War of the Worlds" style threat to Earth. David Fravor from Toledo, Ohio, was flying a F/A-18F super hornet off the coast of San Diego while the US Navy tracked mysterious UFOs for two weeks in November 2004. It was before a bizarre encounter with one of the objects that was later investigated by a multi-million dollar top secret government program looking at mysterious aerial threats. 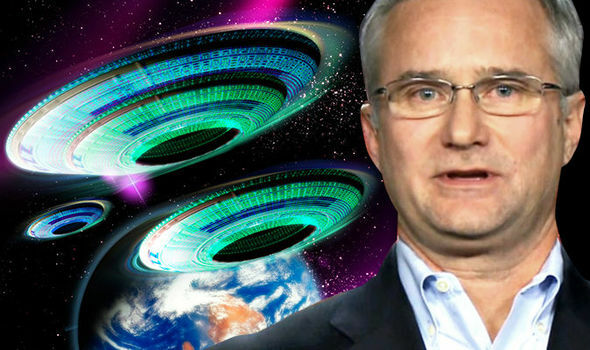 Details of the Department of Defense Advanced Aerospace Threat Identification £16.5million secretive programme investigating the threat posed by UFOs, and Mr Fravor's case, were revealed last month. Cmdr Fravor and Lt Cmdr Jim Slaight were two pilots each in an F/A-18F super hornet on a routine training mission 100 miles out over the Pacific Ocean off the coast of San Diego when it happened. They were with the USS Princeton guided missile cruiser and SS Nimitz supercarrier at the time. Mr Fravor said it was at the end of a two-week period when the Princeton had been tracking mysterious "Tic Tac-shaped" aircraft that appeared suddenly at 80,000 feet, before shooting down towards the ocean. They stopped at 20,000 feet and appeared to hover, before dropping off range or heading back upwards. Speaking to Bostonglobe.com about the implications of the case, known as the Nimitz UFO, Mr Fravor said:“I think the story needs to be told. We need to stop making jokes and start paying attention to it. “This is not a US problem. This is a global issue. Why aren’t we investigating these things? Mr Fravor warned his experience with the UFO had shown him whatever was controlling it had much more superior technology. He said: "Our technology is way, way behind. I know what I saw, oh yeah it reacted to us." According to a report from the New York Times, the US Government-funded programme investigated reports of UFOs between 2007 and 2012, including the mysterious Nimitz case of November 2004. Mr Fravor previously said he looked down to the water and saw waves breaking over an object below the surface. Hovering about 50 feet above this was a white UFO, about 40 feet long and oval. Mr Fravor said: "The craft was jumping around erratically, staying over the wave disturbance but not moving in any specific direction." The water appeared below as if it were boiling. He launched a "circular descent" to look more closely, and it started to fly up to meet them. Mr Fravor said: "It accelerated like nothing I’ve ever seen." The Government-funded investigation into reports of UFOs ran between 2007 and 2012 under military intelligence official, Luis Elizondo, on the fifth floor of the Pentagon’s C Ring. He is now part of the To The Stars Academy, set up by former Blink 182 singer Tom DeLong, to research UFOs. Chris Mellon, who served for almost 20 years in the US federal government in a series of national security positions roles under presidents Bill Clinton and George W Bush, is also part of the academy. He agrees more needs to be done to understand the UFO threat. Referring to the Nimitz encounter, he said: "The pilot’s capture gun camera footage and infrared imagery of the object. "They are outmatched by a technology they’ve never seen. "The chairman of the Armed Services Committee and his counterparts and other congressional oversight committees can easily request a briefing to confirm the veracity of this story and the existence of other events of a similar nature. "If the oversight committees have not already been briefed on this event and others like it they clearly should be. "How else can they adequately assess threats to our forces ad our military requirements?